Residential landlords in Miami Florida have to follow processes for evictions in Florida outlined by the state laws to legally evict a person from property that is being leased. If a landlord tries to evict a tenant with threats, by turning off the utilities or changing the locks, this is considered illegal. At this point, the tenant can file a lawsuit against the landlord for civil damages. That is why it is so important to always follow the necessary procedure. Eviction Process in Florida, attorneys at HLF Real Estate Law can help you. The first step of the Florida eviction process is to serve the proper written notice to the tenant. If the tenant has failed to pay rent, the 3-day eviction notice should be used. When considering the three day period, don’t include the first day of service, holidays, or weekends. 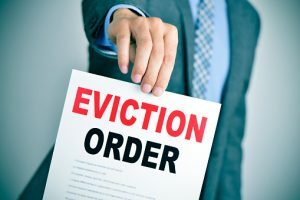 If the eviction is due to noncompliance by the tenant with the rental agreement, but there is a cure permissible or possible, then a 7 Day eviction notice must be given. This is also referred to as the Seven Day Notice to Cure or Notice of Noncompliance. It has to contain the omission or act that constitutes the noncompliance and that the lease is going to be terminated unless the tenant fixes the breach within a period of seven days. The tenant has to be advised that the same noncompliance or breach within the following 12-months is going to result in the lease being terminated with no opportunity to cure the issue of noncompliance. This is a notice served to tenants who are on a month-by-month lease. It has to be served 15 days prior to the rent being due. For example, it is necessary to serve the notice on May 15th if the landlord requires the property to be vacated by May 1st. If the tenant doesn’t comply or leave the property, the landlord needs to serve the Eviction Summons and Complaint document. The document has to be served by a sheriff or a registered process server. The tenant then has five days to submit a response in court. If no answer is received, the landlord should then file the Motion for a Default Judgment, as well as a Final Judgment for Possession. If you need more information about the evictions in Florida, contact experienced Miami Eviction Lawyer for help. They can ensure the process is handled properly and legally. Call today at 305-777-0474.